Hmmmm. I really don’t know how to start this. When I sent in my request for a review copy of this, I think I expected a different story than what came across on the page. I was initally drawn to the title because of its more diverse theme (i.e. LGTB) and as a Gender and Women’s Studies major I like exploring that through different genres of books. So that being said, I liked the components that the book had exploring the topic of sexuality and confusion, but I think the story itself fell a little flat for me. I realize that it is a nonfiction book, but the ending was just…meh. I wanted more of a continuation or a build up. Even if the parts before and after the camp were kept out and kept me in a cliffhanger I would have been more pleased. 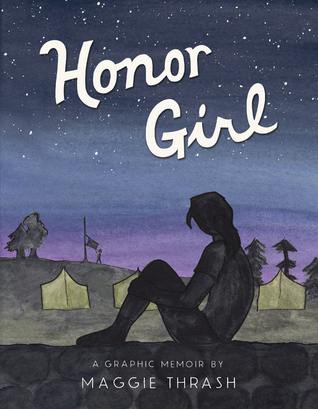 The fact that it was in a camp setting was what boosted the extra star on my rating since I’m weirdly drawn to graphic novels that have anything to do with summer and summer camp. Maybe due to me having spent one too many summers at Girl Scout camp singing songs, learning how to sew, and make silly putty. At the end of the day, I’m sure this will be right up some readers alley’s and maybe I just didn’t relate enough to the events in the story, but it just wasn’t for me. Again, thank you to the publisher for taking the time to send along this review copy to me!